The Internet is getting faster and better. But it may not stay that way. A panel of five unelected bureaucrats would be in charge of setting prices, sanctioning new investments, and dictating how all Americans use the Internet. The Federal Communications Commission—not the free market—would have unprecedented power to control the Internet. This sort of centralized control and overregulation would stifle innovation, limit consumer choice, and ultimately put the United States at a global disadvantage. Rural communities—which already have higher costs and fewer options—would suffer most. Many rural areas are served by smaller Internet Service Providers, who just simply cannot bear the costs of burdensome regulations like the big boys could. So they would be forced to pass along the added expense to consumers, resulting in higher prices for worse service. Those taxes and fees that are nearly impossible to understand on your phone and cable bills? Those would go up. Democrats want to recategorize the Internet under current law so that your home internet and phone data plan could both be taxed, just like your cable bill. What Democrats are jamming through Congress doesn’t stop the bias. And it doesn’t protect your data or your privacy. 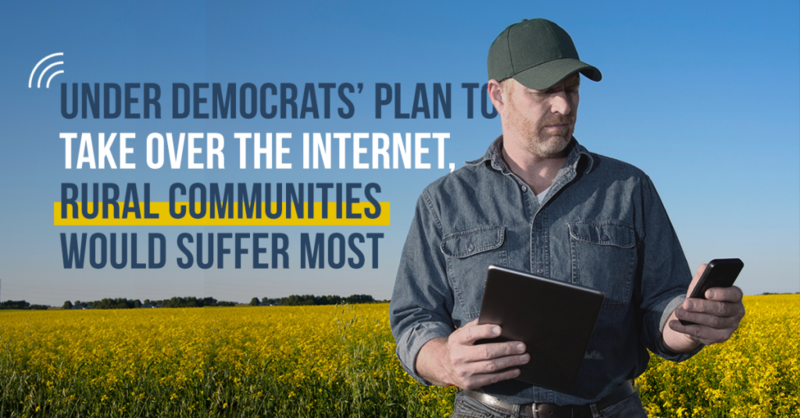 We’re going to keep the Internet tax-free. Permanently. We encourage competition so that broadband gets to rural communities. We’re going to crack down on companies that block sites or throttle speeds.